This is a common story that has been floating around for quite some time. A talented performer denied because of her skin color. Tragic? Yes. Did it happen? Absolutely. 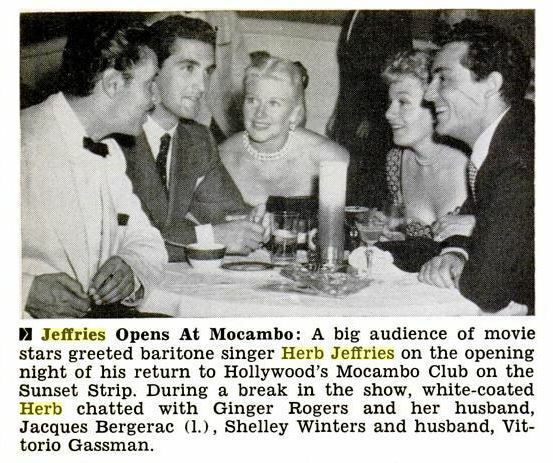 At The Mocambo? No. Huh? The problem starts with this picture. 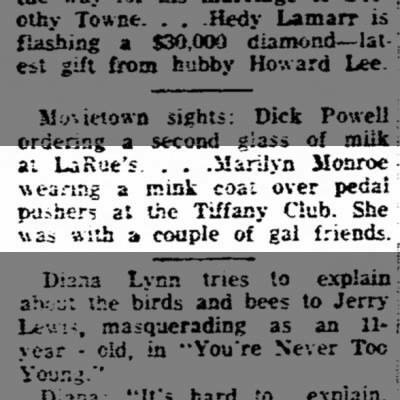 Instead of specifying where Marilyn was that night, it simply says a “Hollywood Club”. 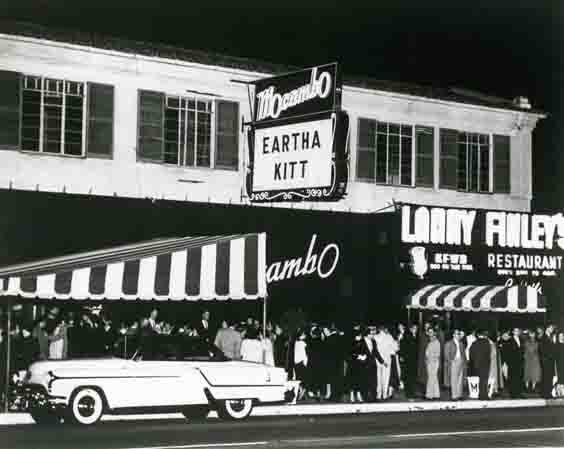 People assume that it was the Mocambo but actually it was “The Tiffany Club”, another hot spot in Hollywood. 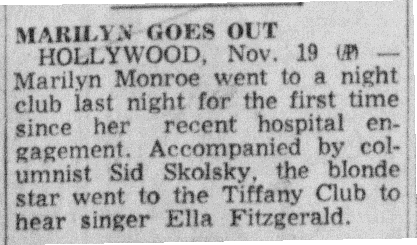 Marilyn then went again on the 19th or 20th with Sid Skolsky and a couple of gal pals. How do we know it’s a different event? Because her outfit above is clearly a black spaghetti strap dress and the other was peddle pushers with her mink. How do we know it was the 19th or 20th? Because Ella’s performance ended on the 20th. You’ll notice that her appearance on the 18th was her first night out since her endometriosis surgery. So what about the Mocambo?! This doesn’t prove she wasn’t there!!! Actually we know she couldn’t have been. There are absolutely no accounts or records of her taking a flight to LA from March 15-21. She was living in New York at the time and would have had to have fly across the country to make it. You’ll also notice that Ella states the press went overboard. Except there are absolutely no pictures from that week of Marilyn in Los Angeles. Huge Thank You to Nancy McClernan for finding these. Notice how Frank Sinatra, Eartha Kitt, Judy Garland, Don Loper, Ella Mae, Jack Webb, and Dorothy Towne are all mentioned. 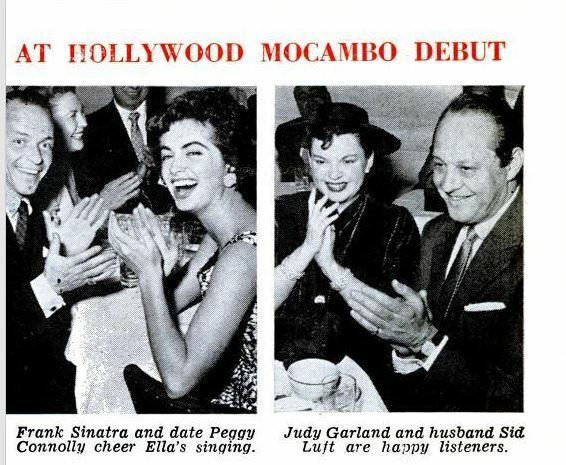 The Mocambo was a huge deal. If Marilyn had been there every night, she would have been seen. Another thing of note, Marilyn was taking pictures with Ed Feingersh March 23-30th. Ella’s performances were from March 15-25th. 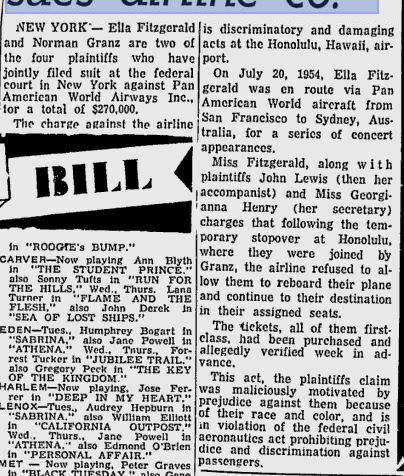 The most common reporting is that Marilyn got the booking for her. 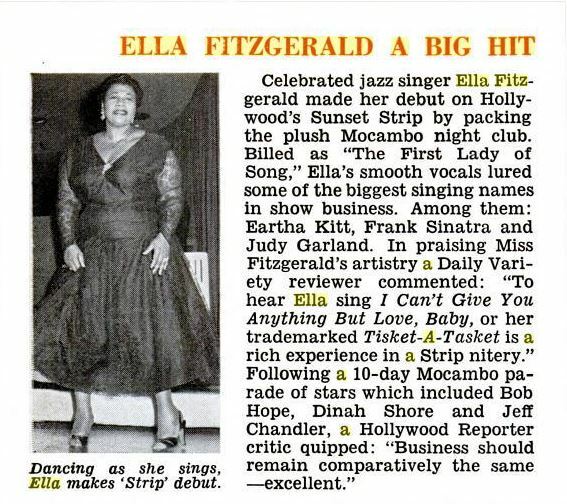 Many attribute Ella’s failure of being asked to perform at the Mocambo to Ella being black. 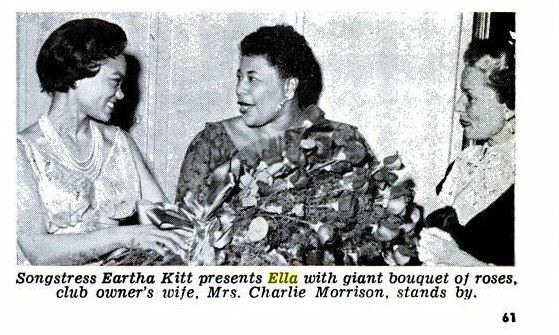 Herein lies another problem, there were black performers before Ella. and Lena Horne in 1942. 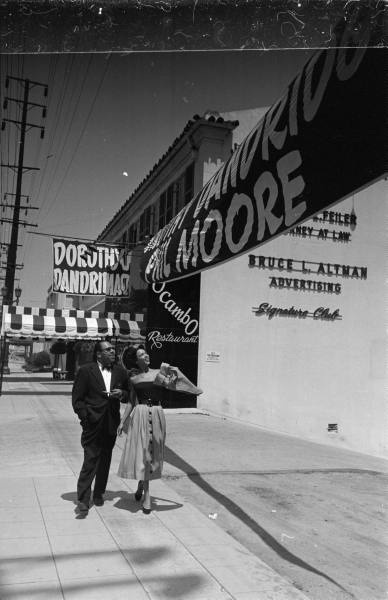 Felix Young is how Lena Horne got her big break for MGM. 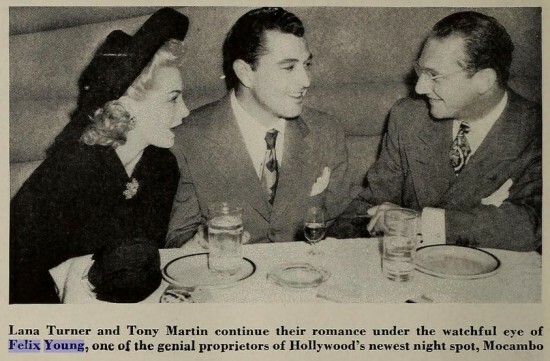 He reopened a recently relocated club called Cafe Trocadero or “Little Troc” with an unknown 25 year old Horne. So why was Ella discriminated against? There are varying accounts. 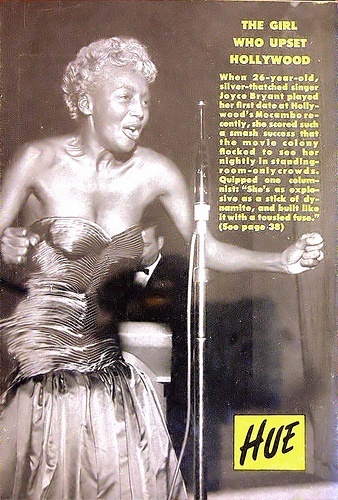 Some say it was because her music style wasn’t what the Mocambo normally played. Others say it’s because she wasn’t glamorous enough. The real reason is most likely one of these. As for the race story. 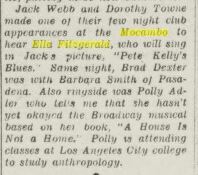 Ella was discriminated against near her Mocambo appearance. . . By Pan Am. You’re trying to take away from Marilyn’s memory! No. . . I’m not. Marilyn was a kind hearted woman who was very much ahead of her time. That can not be disputed. What can be is the commonly recorded account by Ella. 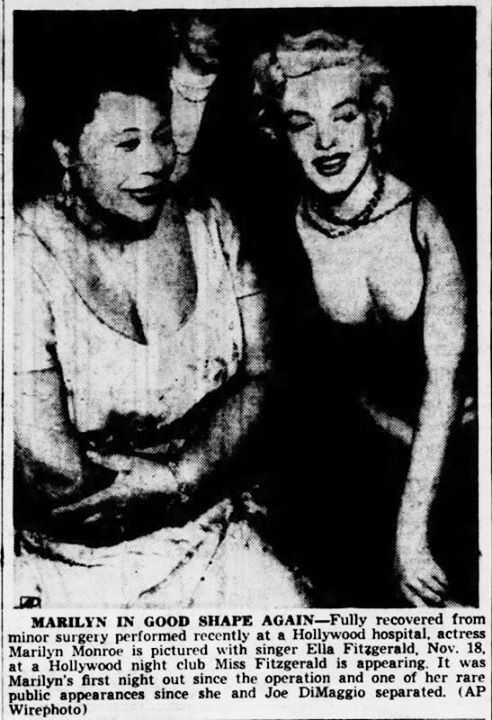 Her version appears to have combined Marilyn’s actual appearance at the Tiffany Club with her helping Ella get booked at the Mocambo. 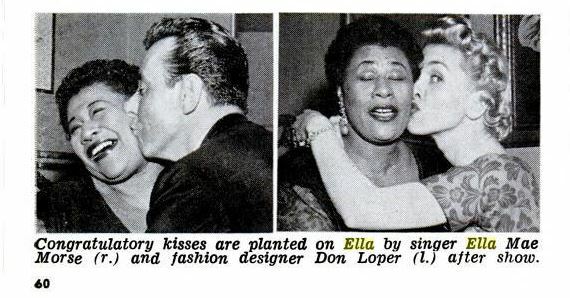 You will notice that Ella herself never says anything about race. She only says that they refused to book her. 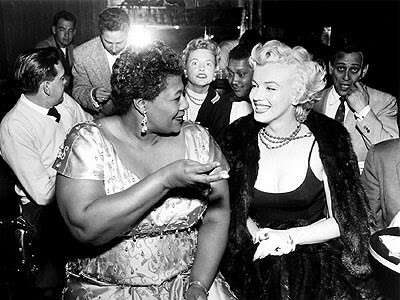 Marilyn repeatedly said in interviews that she liked Ella. Combined with her appearances at the Tiffany Club, Ella did have a significant boost in her career. 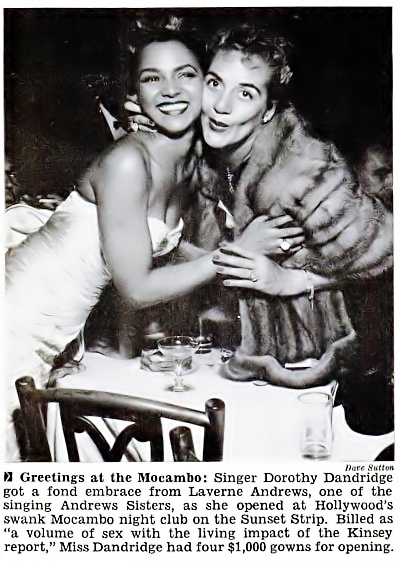 While Marilyn deserves credit for helping a friend, Ella obviously had the singing chops being she was asked back to the Mocambo in November of 1955.